Great news for all the Windows XP users. 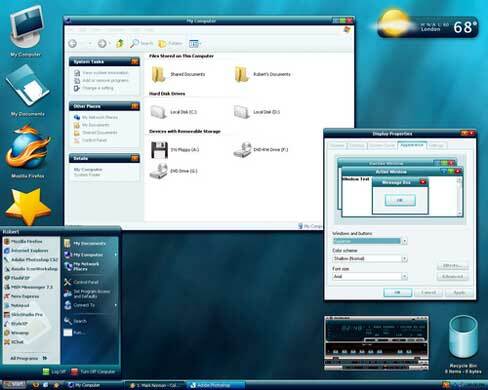 Rafael has released the patched uxtheme.dll file for the final version of Windows XP SP3. Replace this file and enjoy thousands of free visual styles! 2. Navigate to C:\Windows\system32 and backup the original uxtheme.dll by renaming it or by copying it on your desktop. 3. Paste the patched or hacked uxtheme.dll (which you downloaded from here) to C:\Windows\system32. * You should get a pop-up windows titled "Windows File Protection". Click on OK.
* You should then see a second Windows File Protection pop-up window asking you to insert your SP2 CD. Click on Cancel. * You'll then get a third pop-up window asking you if you are sure you want to keep the unrecognized file. Click Yes. * If you get another pop-us then ignore it and reboot your PC. Congratulatiuon you are now ready to use third-party visual styles. 2. Download Replacer and extract the content. 3. Run replacer.cmd. A black command prompt window should appear. 4. Browse to C:\Windows\system32 and find uxtheme.dll. Drag this file into the command prompt window. Press enter. 5. Drag in the unlocked (patched) uxtheme.dll into the command prompt window. Press enter. 6. Confirm the replacement and wait for Replacer to finish. Press any key when prompted. all right! my XP is back in action! Edited by KaneBT, 26 April 2008 - 09:20 AM. There's no system32.dll. System32 is a folder which contains important dll files. After installing SP3 most of your customization done by modifying dll files will get revert back automatically. Will my modifications stay the same? You should replace shell32.dll back with the original one. According to this thread SP3 works with Bricopacks, which are shell packs with modified shell32.dll, but it's better to uninstall all the shell or transformation packs before install XP SP3. also thnx for the link. When we launch Hyperdesk next month, if you download the free hypersuite for Sony Ericsson and install the software, your system will be patched in memory. Once you have Hd running you can use any msstyles and not touch any of your system files. We've been testing it with SP 3 and its been running perfectly. We actually didn't have to do anything. It just worked. So its another way for you to run msstyles without actually having to mess with replacing the actual dlls. if you download the free hypersuite for Sony Ericsson and install the software, your system will be patched in memory. Same like StyleXP and TuneUp Utilities 2008? I think it's safe because it doesn't touch any system file. I am looking at c:windows/system32 and their is no such folder nor file as DLLCache to remove UXtheme.dll from. Yeah, annoying Vista hides all of the files that you really need to see, like your TEMP files to check for viruses and also clear out your comp. It's really frustrating, but I just figured out how to get administrator permissions automatically in Vista without annoying UAC popup, so it is on but is unaffected to me. Yes, similar to what Style XP does. In memory. Edited by userlogin, 08 May 2008 - 10:32 AM. May be replacer doesn't work with SP3. I replaced the file manually without any problem. You have to now replace your original uxtheme.dll file either by booting through any other Windows (dual boot), using Linux Live CD, or DOS prompt.